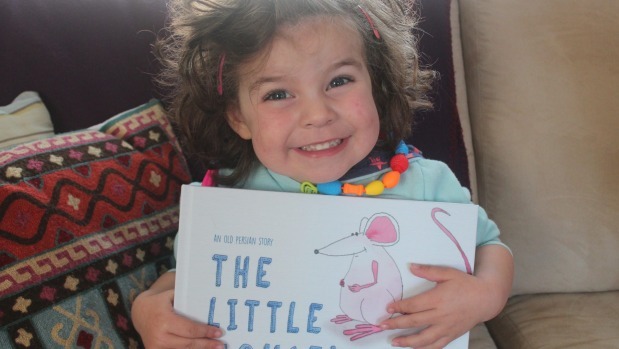 A three-year-old girl’s love for a story about a little white mouse, has inspired her parents to make it into a children’s picture book. Now, the book creators have started a fundraising campaign to get the book published. The Little Mouse’s Tail is an old Persian fable about a mouse who has a problem she needs help with. But, in order to find a solution, she has to help others with their problems first. The moral is about working together, rather than wallowing in sadness. Harley Wanhill-Alemi, 3, shares Dutch, English and Persian heritage. Her mother, Charlotte Wanhill, said creating the book was important, so Harley could know her background. But, it was also about sharing the story with other Kiwi kids, as a way of introducing Persian culture to young children and trying to dilute negative stigma towards Iranian Kiwis. “Other cultures are an integral part of New Zealand’s identity,” Wanhill said. Father and book illustrator Ardi Alemi, who immigrated to New Zealand in 2010, said he still gets a negative first impression when people hear he is from Iran. “People hear ‘Iran’, they think bad things. That’s why I say I’m Persian,” Alemi said. I just want my daughter to grow up proud of her Persian heritage, in New Zealand. The Little Mouse’s Tail needs to raise $13,000. Kickstarter projects are “all or nothing”, which means the project will be funded only it if reaches its goal by May 12. To back the project visit kickstarter.com/projects/ardi/little-mouses-tail/.